I am back today! I really want to start spending more time over here again. Facebook and Twitter is good for connection with people but it isn't the same. And not all the LJ folks I love are on those sites! I love you, LJ folks! Anyway, so that is what is happening with me right now and it is interesting to me and dull to the world. So I am thinking that I may institute my plan (I have a plan? A plan! Wooo!) that I have been thinking about to cross-post selectively from Facebook to LJ. There are some things that I start to write as status updates on Facebook and then they turn out to be way long, more suited to a blog than a status update really. So I think I will start posting those ON my blog, and I'll put them under LJ-cuts so no one who read them on Facebook has to read them again, and then I will be participating in LJ again! And I hope to make posts that do not come from Facebook status updates too. Because I've been missing those. I mean, seriously, guys. [adding this part after, it's not in the FB status] They want to stop having "girls" and "boys" sections in toy stores and let kids pick what they like out of all the toys! They want schools to call kids "buddies" instead of "boys and girls" in order to "counteract traditional gender patterns and gender roles" and give girls and boys "the same opportunities to test and develop abilities and interests without being limited by stereotypical gender roles." God, what a TERRIBLE thing to do, calling a kid "buddy" and leaving the kid to live in whatever gender is natural to them! (It's not like they're saying "Hello, gender-neutral beings." Not everyone is gender-neutral and that definitely should not be forced on them, but calling them "buddies" hardly forces them to identify as or be read as gender-neutral.) The encyclopedia included a gender-neutral pronoun! Which have been around for years, are important to some people, and, you know, is the kind of thing that should be in encyclopedias for those reasons! There's a gender-neutral kids' book! Oh God, no one has EVER learned about something in a book without being BRAINWASHED INTO BEING THAT THING! And, people, I am NOT EVEN KIDDING about this next thing: the company that publishes that book? Is called "Olika", which translates to "different" or "diverse". Never fear, Double X is here to tell you exactly what a "distinctly political agenda" THAT serves! "Different"? "Diverse"? Why do we even HAVE those words in English? They are clearly dangerous and probably shouldn't exist! Like gender-neutral pronouns! Oh and then there are some examples at the end of the article of one or two schools taking it too far -- you know, not keeping "gendered" toys like cars in their nurseries because most boys prefer them. That's just a different, backwards way of enforcing gender, so, yeah, annoying. However, their actions seem pretty clearly not to chime with what the stated goals of the new guidelines Sweden's rolling out. Still, Double X is here to let you know that those are not not individual one-off examples of a couple of people going too far, oh no. They are a CHILLING GLIMPSE AT WHAT THE SYSTEM ACTUALLY IS, even if the vast majority of schools are not doing those things. So what? An anecdote is as good as a wide range of facts and statistics! Man, I really do status-update differently than I blog. I am much more verbose over here. It feels weird to post a condensed version here. Oh well. My fever just dropped to 100.8, so it's below 101 for the first time all day. Maybe the two Advil are kicking in late. Along with this I feel kind of sweaty and my energy supply suddenly just ran dry, so I think the fever's probably broken and is on its way down further. Together with that I am feeling sleepy instead of hyper, so I'm going to go to sleep. Oh that will be nice. *SELFISH*, but I'm glad your fever got you to talk to me too! But, um, I hope you feel better? Every time I hear something about Sweden and gender, it's awesome! And GODDAMN, GIVE URSULA BACK HER TENTACLES. 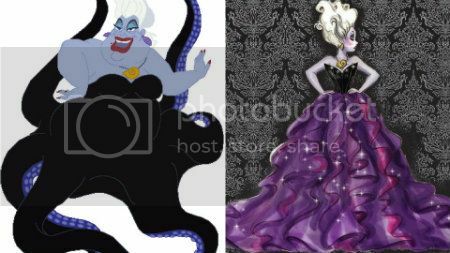 that does not look like Ursula at allllllll. I WANT MY FAT GORGEOUS HALF-OCTOPUS BACK.